Wind-whipped, underpopulated and excitingly volcanic, Iceland is an incredible destination that people are really starting to hanker after. Other places, however spectacular, might feel full and a bit grimy, but Iceland is clean and fresh - new bits are constantly being formed by geysers, mud-pots, volcanoes and glaciers - and there’s a wonderful feeling of space. With a lack of flora above about knee height, Iceland’s landscape splays out vast around you. Brightly coloured geothermal pools and glittering glaciers the only things between you and the aurora borealis. With this scenery it’s really no wonder Iceland has the world’s highest concentrations of authors, artists, musicians and similarly creative souls. It is these storytellers who’ve helped develop Iceland’s rich cultural life. Starting with colourful, vibrant Reykjavik the world’s most northerly capital. 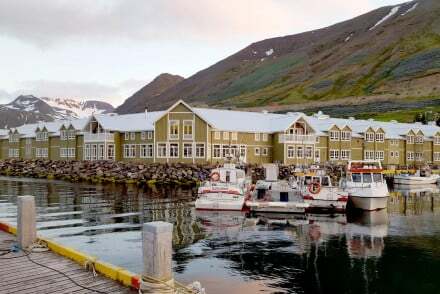 There’s certainly an argument for attributing much of this small city’s uniqueness to its location amid the raw but spectacular Icelandic landscape and to the varied lengths of days and nights that the location brings. The colourful architecture and lifestyle have become pretty well known. While this may be a tiny capital it’s has all the accoutrements of a capital: an excellent National Museum, several world-class arts and design museums, a very cosmopolitan restaurant and cafe culture and a music and nightlife scene that many larger capitals envy. Then just beyond the city you’ll find the wilds of Iceland. The silvery sea on one side and the sparse plains rolling towards the mountains on the other. Iceland has plenty of comfortable adventures you can enjoy including geothermal pools with comfortable facilities, take your family on a sleigh ride into the far-flung reaches and watch the Northern Lights while someone serves you cocoa. Or watch geyser-fields and mud-pots do their thing without journeying too far from a five star hotel while taking tours of volcanoes and glaciers. It all still feels pristine, but if you want to get away from other visitors then consider including the Westfjords on your itinerary. This stretch of land on the island’s south is jagged then smooth and colourful. There are tiny fishing villages, sheer cliffs and high mountains, plus rare birds and animals and a feeling of emptiness you can’t even imagine. You won't get the full Reykjavík experience without learning something about the history of this place. The Settlement Exhibition, built around the excavated remains of a Viking longhouse which was found right under the centre of town, is a great place to start. You’ll also not experience all Reykjavík has to offer if you miss out trying some new cuisine in one of the myriad of restaurants or at least dip a toe into the nightlife. Whether that means dancing ‘till dawn or just seeing some late night live music. You can always recover like the locals, in one of the geothermal pools. The Blue Lagoon pool at the Reykjanes Peninsula is in an incredible field of black lava and the lagoon itself shimmers milk-white. It’s been developed for visitors and is commercial, but still incredible - just book in advance. Lake Mývatn is another other-worldly place, with sulphuric streams and strange craters and lakes. If you want to see a geyser, then Geysir was once your go-to guy. Now however, its neighbour Strokkur is more reliable and goes off every five to ten minutes. The Þingvellir National Park, 40kms outside Reykjavik, is where the Vikings established the first democratic parliament in 930AD. There’s not too much to look at when it comes to remains as such, as the meetings were held outside, but the setting is spectacular. The Snæfellsnes Peninsula and the Snæfellsjökull National Park offer lava landscapes of empty, shiny fields and strange tubes which are home to endemic fauna. This is a great place for a hike and also to watch for whales. Vatnajökull National Park is where you’ll find Iceland’s highest mountain, its largest glacier and the most powerful waterfall in Europe. The strange light conditions highlight the drama of Iceland’s landscape beautifully. The sun does set briefly each night in June, though there’s not really time to get dark before the sun rises again. During December the darkness lasts for around 20hours. It can be incredibly beautiful in winter though and by late January there’s light between about 10am and 5pm, so it’s still possible to visit in winter and 'see' something. Despite the name, Iceland is probably warmer than you expect. Although being so close to the Arctic Circle, Iceland benefits from the warmth of the Atlantic Gulf Stream. Our Gurus recommendations for the best places to stay in Iceland will help you tap into both the natural and cultural treasures this amazing country has to offer. 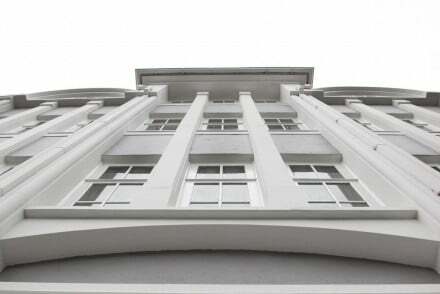 The Hotel Borg is a gorgeous Art Deco hotel with sophisticated rooms and suites. Expect cream leather furnishings against dark wood and marble floors, plus an excellent restaurant and plenty of character. You’re also perfectly located in the heart of town. The Centrehotel Thingholt is a contemporary hotel with an award-winning spa and 52 rooms and suites decorated mostly in white. There are stand-alone bathtubs and a state-of-the-art spa, plus a bistro and bar. 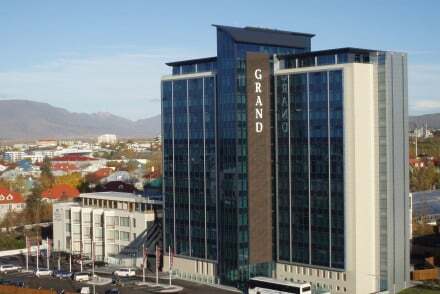 The Grand Hotel Reykjavík sounds grand, of course, but is actually very reasonably priced with rooms starting from around £90 per night. For that you stay in an environmentally friendly, four-star hotel with great city views and light, spacious, modern rooms. The Hilton Reykjavik Nordica is a chic hotel just outside downtown Reykjavik with excellent city views and a five star gourmet restaurant. It’s a big hotel with big hotel facilities. The Ion Hotel is an incredible contemporary design space with floor to ceiling glass, perfect for watching the Northern Lights. 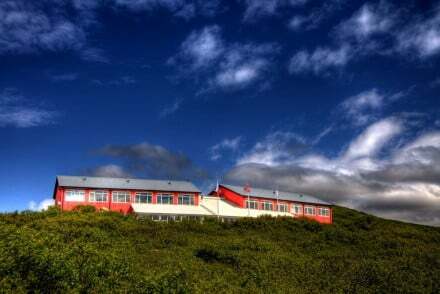 There is a gourmet restaurant, a revitalising spa and is located by pristine lagoons, geysers and the sea. There are 46 rooms starting from around £145 per night. On the edge of a remote fjord is the Hotel Glymur, a collection of 25 rooms and cottages with incredible views - especially when enjoyed from their own geothermal baths. Expect lots of wood, all the mod. cons., fabulous food and incredible views of the Northern Lights - if you’ve timed it right. The Hotel Ranga is another small, luxurious hotel in a remote spot perfect for viewing the Northern Lights. They have a gourmet restaurant serving Icelandic specialities. The Ion Hotel is an incredible contemporary design space with floor to ceiling glass, perfect for watching the Northern Lights. There’s a gourmet restaurant, a revitalising spa and you’re right by pristine lagoons, geysers and the sea. There are 46 rooms starting from around £145 per night. The Reykjavík Marina Hotel is a hip hotel in a landmark building overlooking Reykjavík’s marina, which is a pretty trendy part of town. There are 147 contemporary rooms and suites - some with floor-to-ceiling glass walls overlooking the marina. There is also a lively bar and restaurant. 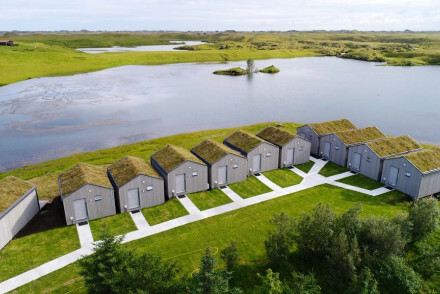 Escape to the Icelandic coast and the remote Hotel Budir, a charming hotel with 28 traditional rooms and suites with attractive, country house hotel style decor and a gourmet restaurant serving fabulous Scandinavian cuisine. Reykjavík’s 101 Hotel is a superb boutique hotel with minimalist decor in 38 rooms and suites. Expect black and white furnishings, big bathtubs and balconies, plus a lively bar, an excellent spa and a very stylish restaurant. Sounds like it’s not really for families, but actually it’s very family friendly. Reykjavik Airport is only for domestic flights. International flights arrive at Keflavik International Airport which is about 40kms outside the capital. If you’re going to travel by bus into town you can buy bus tickets in advance at the airport - which will make it easier for you. Taxis are available but they’re not cheap. Warm summers and midnight sun make the summer (May to August) a pretty unforgettable time to visit. If your in search of the Northern Lights, the best time is either February to March or September to October. Stylish and sleek, Sandhotel is in the heart of Reykjavik. Embodying Icelandic minimalism, the hotel features sharp design, muted colour scheme, carefully chosen furnishings and a superb restaurant. A great base from which to explore Iceland's capital. Sights nearby - Five minutes walk from Hallgrímskirkja Church. 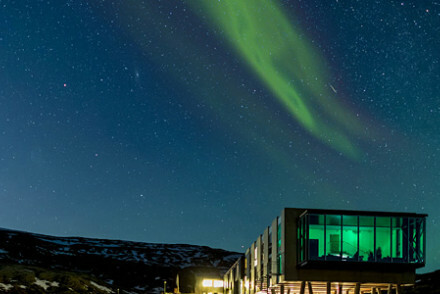 Environmentally-friendly four star hotel in Iceland's capital Rekyjavik with great views across the city. Range of light, spacious and modern rooms and suites available including family friendly options. Free shuttle services to city centre, and free entry to Botanic Gardens. For a slick city stay. 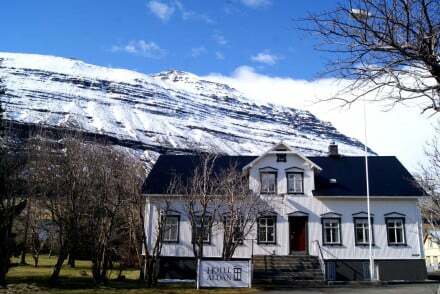 This historic riverside hotel is split across two sites, Hotel Snæfell and Hótel Aldan. The décor of the rooms seeks to preserve a sense of the buildings' tradition, with pine floors and dark wood furniture. Groups can stay in the Old School apartments in the old town centre. A charming guesthouse. 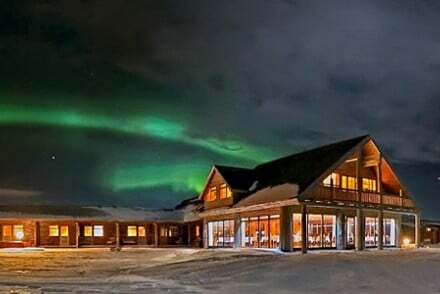 A remote hotel in the perfect position for viewing the Northern Lights. Positioned above a fjord, it offers magnificent views from its own geothermal hot tubs. Rooms and cottages all in wood with balconies and all the mod cons. Fabulous food. Perfect for couples, families, and activity seekers. 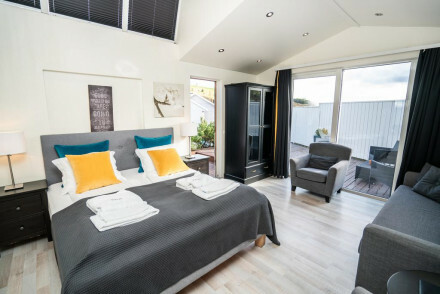 A cozy and heartwarming, small luxury hotel in the South East of Iceland with an outstanding dining experience. Foodies - Gourmet restaurant serves Icelandic specialities. An utterly charming hotel on the coast line in a remote setting. Traditional rooms and suites offer wooden floors, big bath tubs, and attractive country house style furnishings. Gourmet restaurant serves fabulous Scandinavian cuisine. Romantic, very family friendly, and perfect for Icelandic sports. 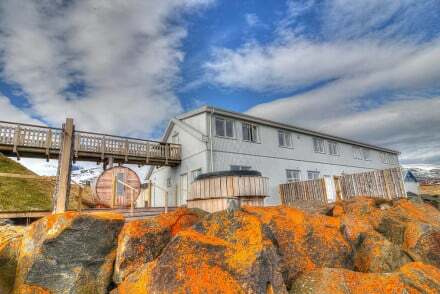 Gorgeous Icelandic style harbourside hotel boasting stunning views of the harbour and mountains. Rooms are chic, modern and bright, and there is an indulgent outdoor hot spring bath, hot tub and steam room to enjoy. A top quality restaurant serves European cuisine. Superb! An Icelandic marvel ideal for watching the Northern Lights from. Contemporary designer space with floor to ceiling glass to capture the night sky. Gourmet cuisine from a modern Nordic kitchen, and a revitalising spa. Lagoons, geysers, and sea to swim, fish, and snorkel in. Romantic and adventurous! Views - Fantastic lake and moutain views, as well as the Northern Lights! Foodies - Modern Nordic delicacies. Set among bubbling springs, the hotel's eco approach and contemporary lifestyle promise an exceptional experience. The bright rooms feature wood flooring and are designed by local artists. Offers an outdoor pool, two hot tubs, plus the Varna restaurant serving local produce. A magical stay. 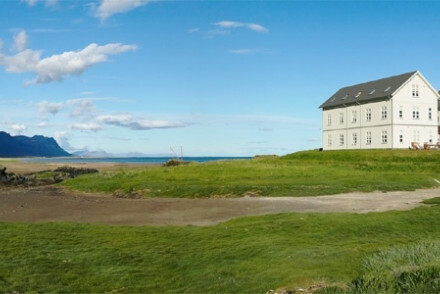 A unique and luxurious hotel occupying a fantastical spot in rural Iceland. Contemporary design throughout - rooms are sleek, minimalist and take full advantage of the fabulous views. Nordic inspired menus are offered up in the beautifully designed restaurant and there are thermal baths too. 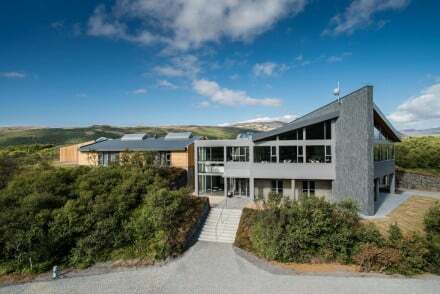 Hideaway - A contemporary hotel set in a secluded (and outstanding) location surrounded by waterfalls, lava fields and glaciers. 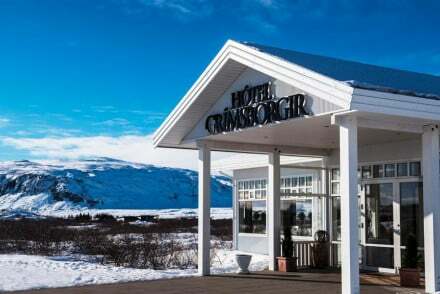 Lying in Iceland's Golden Circle, the Grimsborgir's location stirs the senses. The classically-furnished rooms are spacious and have much natural light. Offering geothermal hot tubs and a restaurant with live entertainment and international cuisine. An unforgettable destination. A rural guesthouse and campsite in a beautiful natural setting. 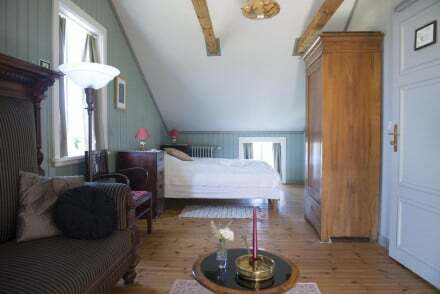 Rooms in the old farmhouse are simple and bright with thermally heated floors. 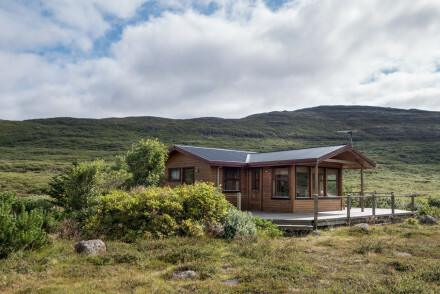 The summer houses offer accommodation for groups in pretty pine cabins. Guests can enjoy three thermal springs and a pool. A spectacular retreat to nature. This intimate hotel offers guests a truly Nordic experience blending a contemporary feel with eco-living. The spacious rooms are located in individual cabins and feature glass doors leading onto beautiful lakeside views. The region is unique and offers guests a host of natural wonders to discover. An idyllic summer guesthouse on the island of Flatey. Set in the island's quiet village, the best of the bright and homely rooms have breathtaking sea views. The restaurant serves fresh seafood dishes daily in a traditional dining room. An intimate hotel, and rated one of the top ten in Iceland. Lying in a fishing village on the island's eastern coast, Blabjorg's location captures Iceland's magical feel. The accommodation includes spacious apartments to rent offering sea views. With a hot tub, infrared sauna and steam room, plus a restaurant and bar. A guesthouse catering to all your needs.